This fantastic Old Mill 2 bedroom 2 bathroom 2 story Cabin has lovely wooden interior walls throughout. The comfy furniture is perfect for stretching out in front of the stacked stone gas fireplace, and watching TV or visiting with family. With fully equipped kitchen and wooden picnic table, there will be no reason to venture out of the cabin. The bedrooms have beautifully designed wooden King and Queen size beds and the master has an alluring corner Jacuzzi, for those romantic evenings indoors. Take advantage of the rockers or swing on your front deck and take in that fresh mountain air. Let your worries disappear as you soak in the bubbling hot tub. This cabin was quite special, definitely home away from home. It was beautiful, cozy, and clean. The beds were so comfortable! My family really enjoyed staying here and we will stay there again. Great experience and extremely clean. Nice location. Not far from pigeon forge and gatlinburg and no traffic on road. Plenty of linens and all around great cabin for families with kids. Had a wonderful time. This cabin was perfect for the three of us. Pictures doesn’t do this property justice. Flat screen TV’s in each room was perfect. The only small problem was the ceiling fan upstairs made a loud noise when in use. Had to turn it off to get some rest. Other then this, the hot tub was perfect, slept like a baby in the king size bedroom. Great location, easy to locate too. A cup of coffee while sitting in the swing on the front porch was awesome! I look forward to coming back next year. Thanks for the comfortable stay! We wanted a quiet getaway and this place was perfect!! All of the small touches made this the perfect cabin! 7 of us came to stay at the Old Mill Lodging, we rented two cabins. Both cabins were great. Each had a rustic but modern charm of it’s own. They were very clean, had beautiful homemade soaps, were large and comfortable. All the staff we worked with from beginning to end were wonderful and very helpful. The view from our cabins – magnificent. You are close to the hustle and bustle of the area but you would never know it, you feel secluded in the woods. After a long day of activities we all enjoyed the hot tubes on the screened in porches. There was absolutely nothing we did not like about either cabins, the resort area, the staff, or the company itself. If we could give a higher then 5 rating we would. If you are looking for a wilderness get-away but still want the fun of activity from local towns, this is the place. The only sad part about our entire trip was having to leave. Thank you to everyone from Old Mill Lodging for an absolutely wonderful time, we will be back! Property was exactly as portrayed and made for the most amazing and relaxing weekend. We were looking for a place away from the world to just enjoy quiet time with each other. This property was exactly what we needed. We’re already planning the next trip. We have stayed at the Old Mill Cabin rentals for several years and every time the cabin is clean and comfortable. Wonderful amenities and quiet surroundings!! All we wanted was to get away for a few days and relax and we could not have chosen a better option. The cabin is easy to get to but set away enough that you aren’t hearing sounds from the interstate. It was the most quiet and peaceful vacation I’ve ever taken and I was thrilled that the pictures actually matched what we walked in to find. 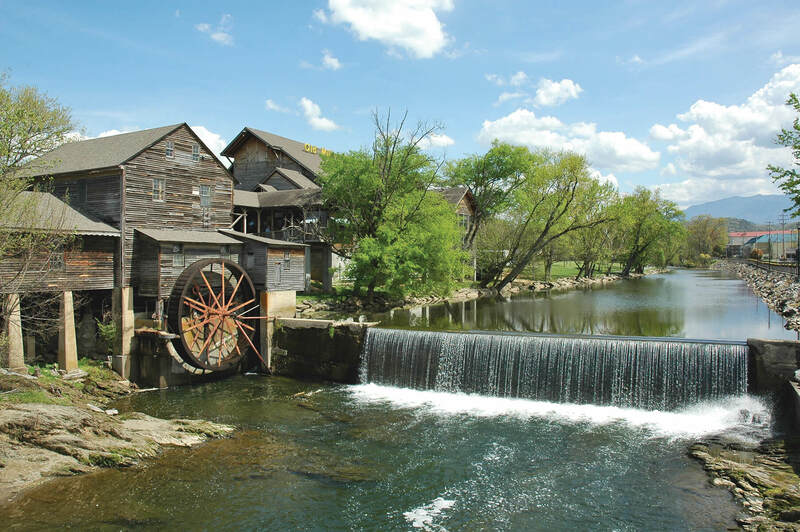 It’s close to Pigeon Forge and so many fun things to do. My boyfriend and I had a wonderful time in the Peaceful Woods cabin! We spent an evening making dinner in the spacious kitchen, relaxing in the hot tub, and watching movies in the living room. We spent a day hiking the Smokies (even after pouring rain all night) and had a blast. The cabin was clean, spacious, and very home-y. I would recommend Old Mill’s cabins to just about anyone who wants to be close enough to the tourist attractions but far enough away to feel comfortable and, well, peaceful in the woods!